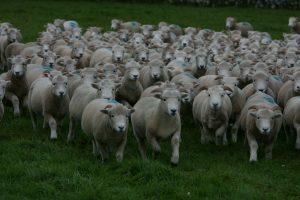 Welcome to the Exmoor Horn Sheep Breeders’ Society’s website where we aim to provide you with a wide range of information and advice about Exmoor Horn Sheep, one of Britain’s most famous native sheep breeds. For all of its beauty, Exmoor’s climate requires hardy sheep that can withstand harsh winters, and thrive off sparse upland hill pasture. 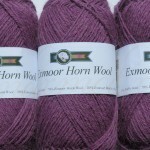 Over many generations the Exmoor Horn has adapted itself perfectly to this environment and is a very effective grazer for sensitive landscapes like Exmoor, whilst thriving and finishing fast when brought to lusher lowland pastures. By grazing these distinctive upland pastures, the Exmoor Horn Sheep produces lamb of outstanding flavour and texture. The breed is also famous for its mutton, considered the finest mutton available by the London restaurant trade in the 1800s; a market that has seen a steady decline until the current time where awareness raising by the Mutton Renaissance Club has led to a resurgence of interest in this traditional specialty product.